At least 127 people, including 30 children, have been killed in the last two weeks by shelling by the army of the regime of Syria's president Bashar al-Assad, backed by Russian warplanes. 23 people, including 5 children, were killed on Sunday. Drones have patrolled the sky since Sunday morning and warplanes had heavily bombarded the towns of Mesraba and Harasta. Heavy shelling also hit Eastern Ghouta and dozens had been injured. Ghouta residents are so short of food that they are eating trash, fainting from hunger and forcing their children to eat on alternate days, according to United Nations reports. The region struck by Syrian artillery and Russian warplanes is listed as a "de-escalation" zone, by agreement between Russia, Iran and Turkey in a series of "peace talks" held in Astana, Kazakhstan. However, Bashar al-Assad never agreed to abide by the de-escalation zone agreement. The picture at the beginning of this article showing Russia's president Vladimir Putin and Syria's president Bashar al-Assad hugging during a meeting in Sochi last week was meant to send a message to the world that the war in Syria was over, and the two men had brought about the victory. "I asked the Syrian president to stop by. I would like to introduce you to people [al-Assad] who played a key role in saving Syria. Regarding our joint operation to fight terrorists in Syria, this military operation is indeed coming to an end. I'm pleased to see your willingness to work with everyone who wants peace and settlement." I've occasionally quoted Joshua Landis, an American analyst and expert on Syria, who is widely quoted in the media. When I quoted Landis two months ago, he was quite pessimistic about Syria, and thought that the violence was spiking almost uncontrollably. The Syrian opposition that America has supported -- they just met in Saudi Arabia and named a new leader and they're going to be in Geneva. They have promised not to demand that Assad go, but they insist on a transitional government, and the question is, what role does Assad play in that? The Americans want there to be elections overseen by the UN, The opposition believes that this is a trap, that Assad will never allow free elections, that the West won't enforce free elections. And this will all become a lot of words and rhetoric towards Assad regaining literacy and rule. 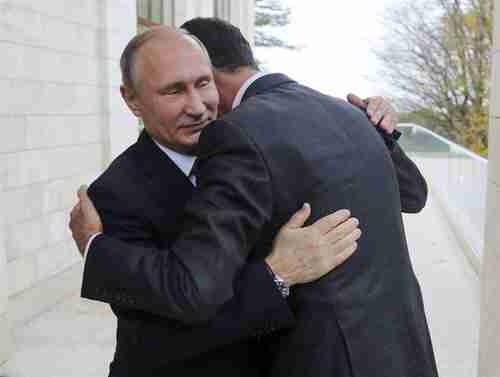 This hug [between Putin and al-Assad] in Sochi was a victory hug in a sense, claiming that they had won against ISIS, and they had won in the face of the world, and that's what they were trying to convey. The sense is that if the world wants to move ahead in Syria, they have to recognize Assad has won, Russia has won. The United States is not really prepared to do that. The US has helped what they call the Syrian Defense Forces (SDF), which are really Kurdish forces in the north of the country. [The SDF] destroyed a lot of ISIS territory, but 25% of Syria's territory is now dominated by these Kurdish forces, and there are 2,000 American special forces in the north of Syria, Almost 50% of Syria's oil is in that region. So that gives America a lot of leverage. The US authorities have said that they're gonna stay in Syria until they get traction with the Geneva process. I don't think we're going to get a lot of mileage out of Geneva. Assad believes he's won. He is not going to make concessions, even if America stays in northern Syria. I think Assad will surround the Americans, he will talk with the Turks, and he will try to pressure the Kurds and the Americans, who are in a weak position there, and think, "I can sit them out, I'll wait until President Trump is out of there, the next president comes in." [President Putin has come out of this domestically looking pretty good.] Russia is helping to establish a new security architecture in the northern Middle East, with Iran, where Iran and Russia will have a lot of sway, in countries stretching from Iran right through to Lebanon, where Hezbollah is the biggest, strongest power. And this really pushes the United States out of this region, and helps Russia regain a lot of the sphere of influence that it lost during the cold war. And even Turkey is now going to Russia much more often then it's going to Washington. This has implications [for NATO and] for the entire region, and for American power, which used to be the dominant superpower. Today the world is looking a lot more like the 19th century Europe where there's spheres of influence, with lots of different great powers, all elbowing each other for leverage and sway." Landis claims that al-Assad and Putin have won, and the opposition has lost, but he certainly doesn't make that case, except by repeating Putin's claims. And many things are omitted. Let's start with Saudi Arabia, who Landis says is "dispirited" and resigned to an al-Assad victory. The new Saudi leader, Crown Prince Mohammed bin Salman (MBS), in the last three months has taken numerous extremely aggressive and surprising steps to block what he sees is an existential threat from Iran. These steps included a land, sea and air blockade of Qatar, a land, sea and air blockade of Yemen, a house arrest of dozens of wealthy Saudis on charges of corruption, and bringing about the resignation of Lebanon's prime minister Saad al-Hariri. Does Landis or anyone think that MBS is going to stop there, and just let Iran gain control of parts of Syria? I certainly don't think so. Next, Russia has announced that it will substantially reduce its forces in Syria by the end of the year. Two years ago, al-Assad was facing complete defeat, until Russia intervened with massive military forces, especially airstrikes. Russia's forces saved al-Assad, and in particular destruction of Aleppo was accomplished by Russia's warplanes. East Ghouta is larger than Aleppo, which indicates to me that Russia's military will have to stay engaged a lot longer than the end of the year. Landis points out that the Kurds control 25% of Syria, including half of the country's oil, and that the Kurds are backed by US forces. This Kurdish control is intolerable to al-Assad. Landis says that al-Assad will simply wait until Donald Trump is replaced by another president. Huh? Is al-Assad really willing to wait and allow the Kurds to consolidate their control of the region until 2020 or 2024? And why is he so certain that the next president would allow the Kurds to be killed by al-Assad (and the Turks)? Putin, al-Assad and Landis all have what I would call a "1990s mentality." At that time, most of the world was in a generational Unraveling era, meaning that survivors of World War II were still alive and running things, and were prepared to make sure that nothing spiraled into war. 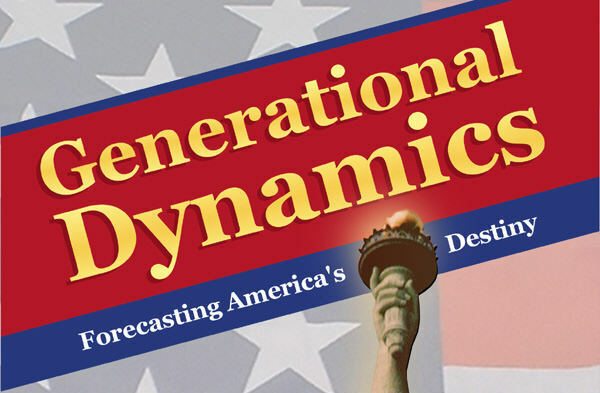 Today, the world is in a generational Crisis era, with the WW II survivors gone, replaced in positions of power by younger generations with almost no clue what's going on in the world. In the 1990s, Saudi Arabia might have been content just to let the situation in Syria resolve itself. Today, Saudi leader MBS has already proven that he's not willing to let anything just resolve itself. People today who make plans based on a "1990s mentality" are going to be terribly wrong. The world is a very different place today than it was in the 1990s.